Cancer is usually characterized as a heterogeneous disease with different types and subtypes that involve uncontrolled cellular growth and reproduction. It is one of the leading causes of death in the developed and the developing world; almost a million people around the globe are losing the fight against cancer every year. The early diagnosis and prognosis of a cancer type have become inexorable in cancer research. In UAE, approximately 4500 new cases of cancer are reported every year, which equals to 12 new cases a day, according to Abu Dhabi Health Authority. Cancer is the third leading cause of death in UAE, after cardiovascular disease and accidents. Prognica, an AI powered health-tech startup, aims to improve clinical outcomes and accelerate the discovery of breakthrough advancements in the fight against cancer. Prognica analyses medical images and generates information and data to help predict and diagnose cancer using artificial intelligence and deep learning. Our goal is to develop intelligent, scalable and affordable disease screening solutions which can empower medical experts and facilitate quality healthcare delivery to the masses. Our initial focus is on the solutions for the screening tests so that we can positively impact a larger population not only in UAE but the entire region. The company is now collaborating with few reputed healthcare providers and institution across UAE to develop its product. According to HAAD projection report, Abu Dhabi will need 4,800 new doctors and 13,000 new nurses by 2022. And the Director General of the DHA estimated that Dubai will need 7,323 more doctors and 8,510 nurses over the next decade. The high cost of medical treatments and limited super specialized care in areas such as oncology and cardiology are driving outbound medical tourism. We have a clear vision: to reinvent cost effective disease management through early detection and intervention. 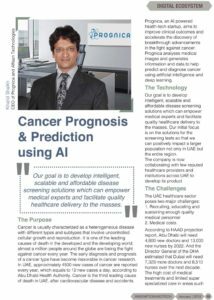 We are tackling this long term goal by making cancer screening and diagnostics as accurate and accessible as possible, by using advanced analytics tools like image processing and deep learning, Natural Language Processing (NLP) to improve patient care, hospital administration, supply chain and logistic efficiencies. The process is to first digitize the sample slides through a microscope, scan whole slides and upload onto the cloud by converting the large image into a binary metadata. AI engine then takes over, which classify and tag the visual data, not only to churn out results, but also support it with visual evidence (like tagging & annotations) to make it easily verifiable. With the advancement of AI, as more and more new data keeps coming in, the machine continues to learn itself like humans. And it starts generating solutions. There is no need for a manual review by a pathologist by putting a slide under a microscope. Remote diagnosis is made possible, because the pathologist need not be sitting next to the microscope or blood slide. They can access from anywhere, anytime. Our method is primarily based on a convolutional neural network (CNN) and the Wide Res Net 50 residual network formulation. In our approach, we first trained the CNNs on a suitable set of test datasets. Then we applied the trained deep model to partially overlapping patches from each whole slide image (WSI) to create prediction heatmaps. By utilising machine learning on whole slide images (WSI), we have developed a prototype for automatic detection of metastasis in a lymph node. Our early results of detection were shown to have an accuracy of upto 73 percent. Our deep learning expert team and a pathologist is needed to work closely to translate the deep learning algorithms to digital pathology tasks. It is not that AI will entirely replace histopathologists, but rather it will provide increased efficiency and accuracy to the diagnosis, by providing a preliminary diagnosis much faster.